Reduce crime in the city with the Police Headquarters with Prison. This large set has everything you need to protect the city and lock away the bad guys. From the command center, you can monitor both the prison and the surrounding city for criminal activity. Once the bad guys have been captured, bring them into the processing room for their mug shot and fingerprint ID. Then, take him to his cell, but keep a close eye to make sure he doesn't escape through the breakthrough wall! 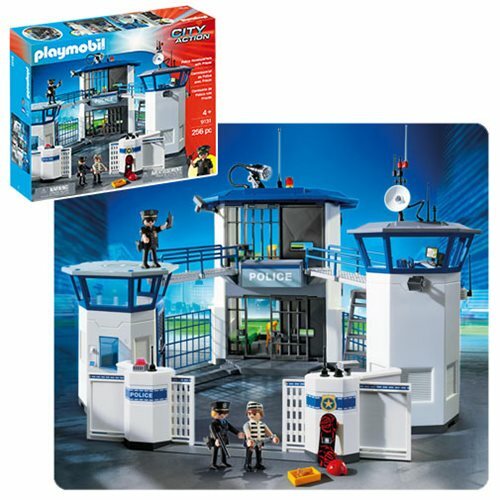 Set includes three figures, handcuffs, desks, chairs, cots, prisoner clothing, sink, toilet, equipment locker, helipad, computers, badges, and many other accessories. Recommended for ages four and up. 25-inches x 17 1/2-inches x 10-inches.